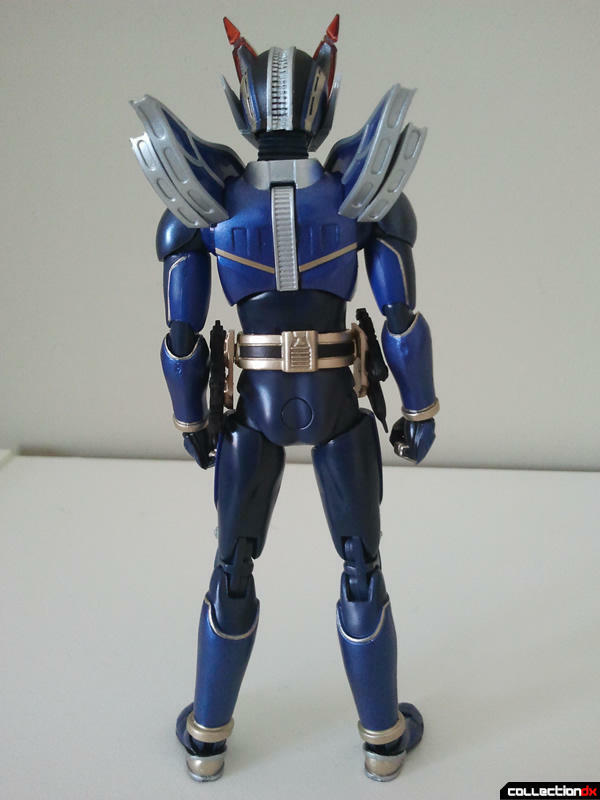 Review sample provided Blue Fin Tamashii Nations. Get yours at BigBadToyStore! Kamen Rider New Den-O was one of the earliest exclusive S.H. 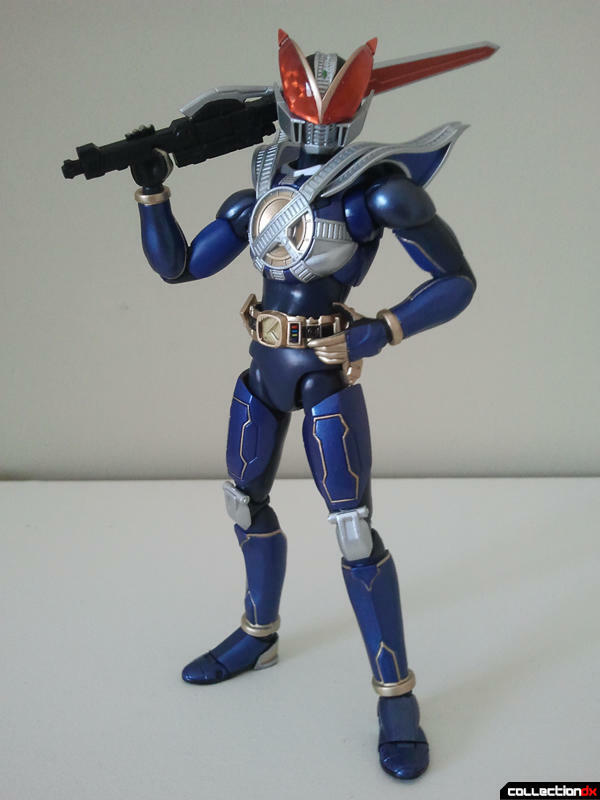 Figuarts ever made, and was accordingly one of the most expensive and hard to get a hold of Figuarts as well. 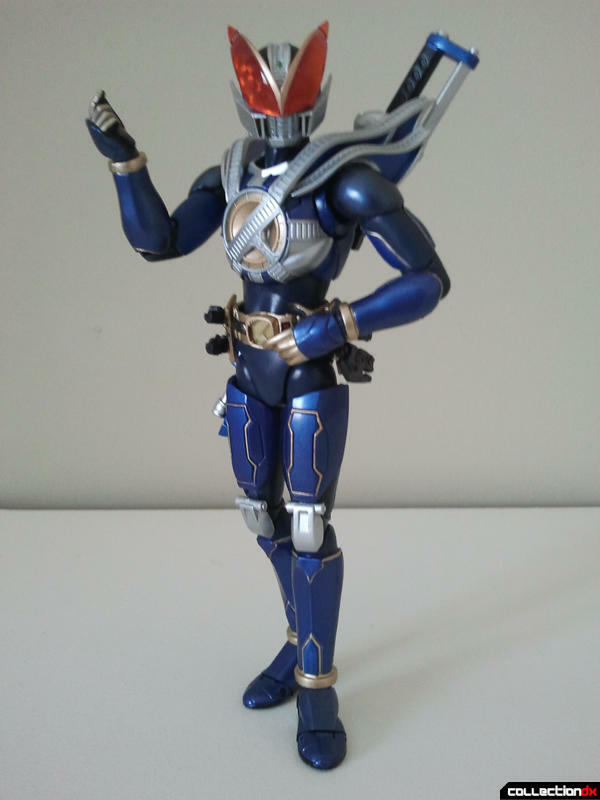 However, with the recent trilogy of Kamen Rider Den-O movies released, Bandai released a brand new version of this character to tie in with Kamen Rider Den-O: Episode Blue, a movie all about Kamen Rider New Den-O. Kamen Rider New Den-O is Kotaro Nogami the grandson of Ryotaro Nogami, the current Kamen Rider Den-O. I enjoy Kamen Rider Den-O, but it definitely isn't one of my favorite Kamen Rider series. Still, there is no denying how visually striking the New Den-O design is. Den-O's main theme is time traveling and trains, and that's present in New Den-O's design. The upper torso is lined rail tracks all along the shoulder armor, and a giant junction in the chest as well. 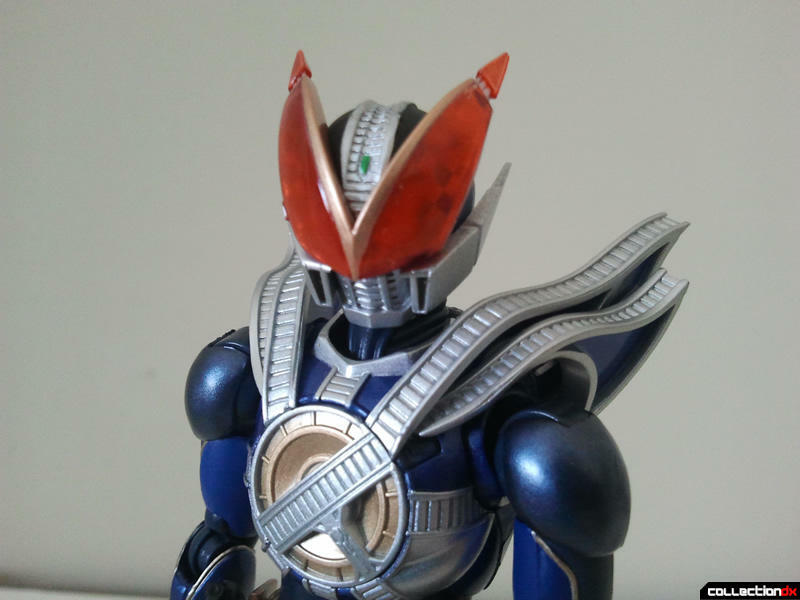 The giant sharp angled eyes really help make this design stand out from other Kamen Riders. 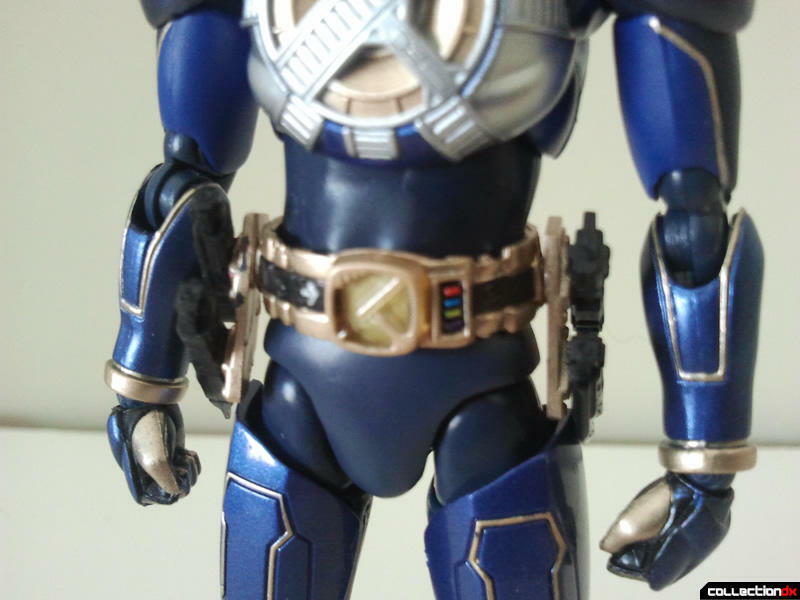 The belt details are good as always, with every tiny button painted. 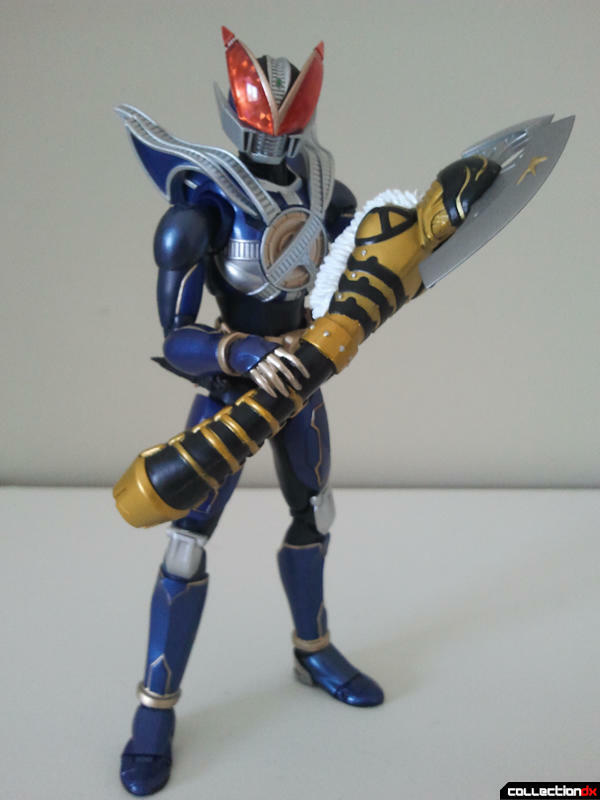 All of the Den-Gasher weapon pieces are also mounted on the sides. The articulation is great as all Figuarts have. New Den-O unfortunately also has plastic feet, but however, he has a brand new feet design that is a great improvement to the old ball joint feet. The feet now work like a Figma or Revoltech joint to allow for some absolutely wonderful ankle tilt. One thing to be careful with are the outer shoulder pads. 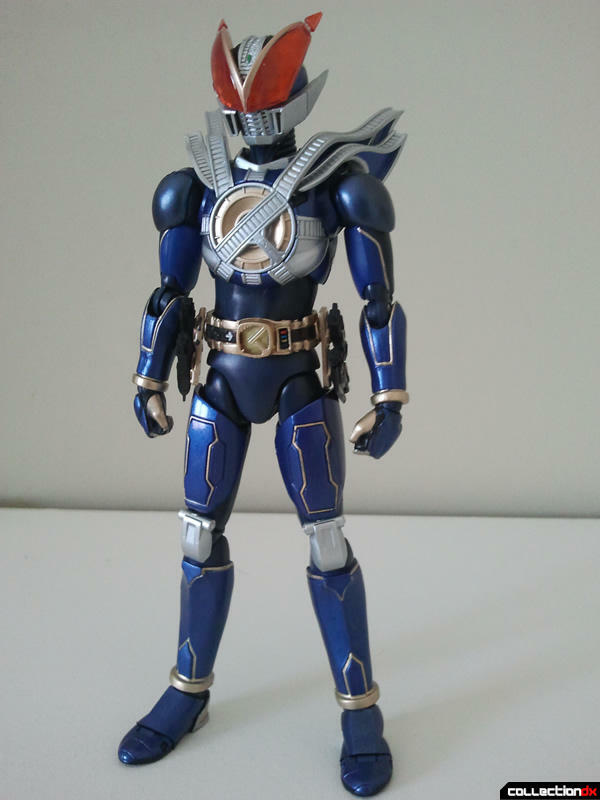 The outer shoulder pads are actually movable along a very tiny ball joint positioned near the torso. It's very thin plastic that's very hazardously attached to the figure. Just something to watch out for. When I opened New Den-O, I had never seen a Figuarts tray that was so packed full of parts and accessories. With four weapons and four pairs of hands on top of a bunch of other crap, New Den-O is one of the most loaded Figuarts releases yet. Most of the hands are standard fare: closed fists, holding hands, splayed hands. He also has two unique hands. One to hold a very specific weapon, and a snapping fingers hand that is for signature New Den-O poses. New Den-O's signature weapon is formed when his Imagin partner Teddy turns into the Macheteddy: A giant sword with a gun built into it. It's a huge well painted weapon, and Teddy's tiny little mouth moves as well, which is actually kind of creepy. 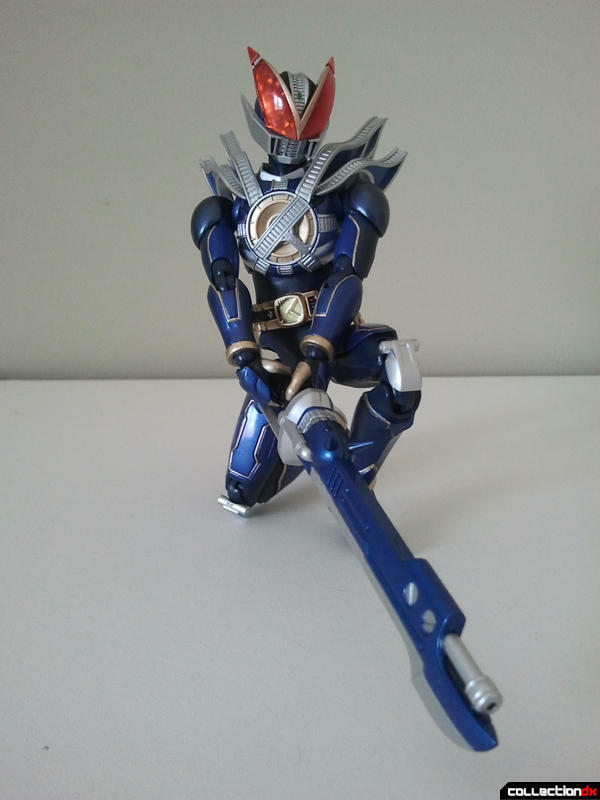 The other sword that New Den-O comes with is the Den-Gasher sword, along with an additional set of side skirt pieces to show that the weapon has been formed. It's a simple sword, and gets the job done. 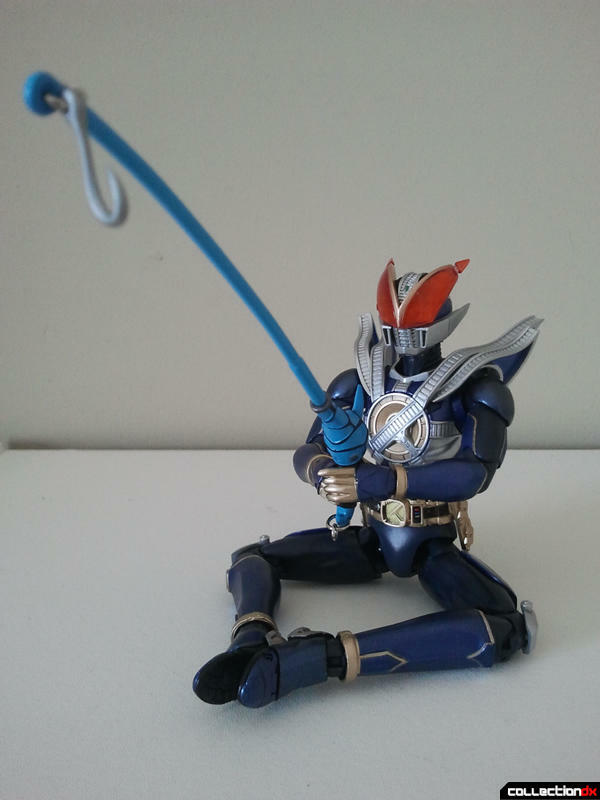 My favorite weapon that New Den-O comes with is the Urataros fishing rod. 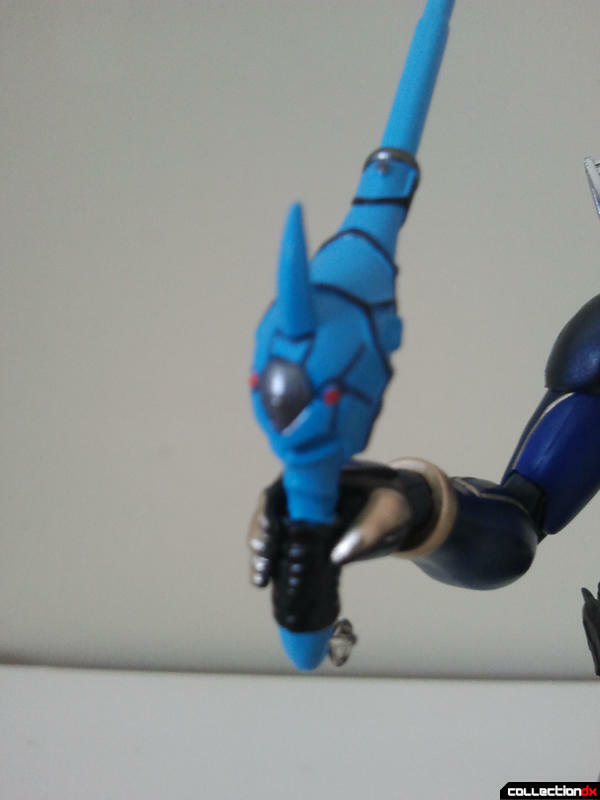 The fishing rod has a tiny little Urataros face on the handle along with an actual danging hook at the tip! 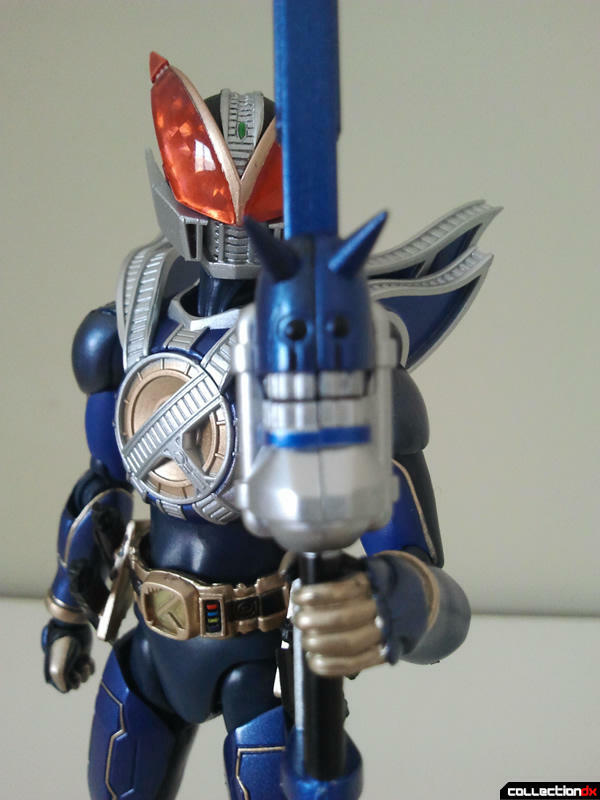 It's used as a whip-like weapon in the movie, but as an accessory I think it just looks neat as a whacky thing for my Kamen Riders to use to go fishing. The final weapon is also the most ridiculous one. The Kintaros axe is a giant whack of painted plastic and looks absolutely gorgeous. 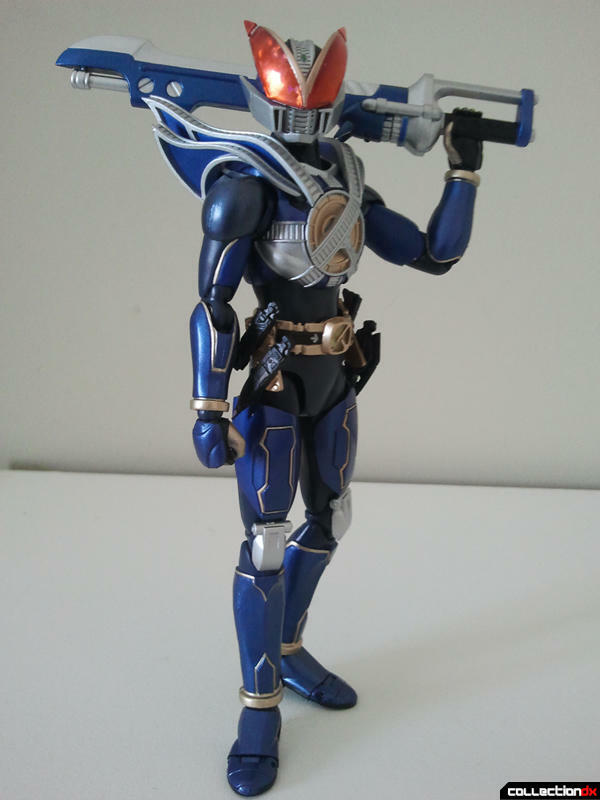 New Den-O comes with a specific hand to hold this axe, which unfortunately is a bit heavy and cumbersome so the only poses possible are ones where New Den-O holds it in place of slings it over his shoulder. 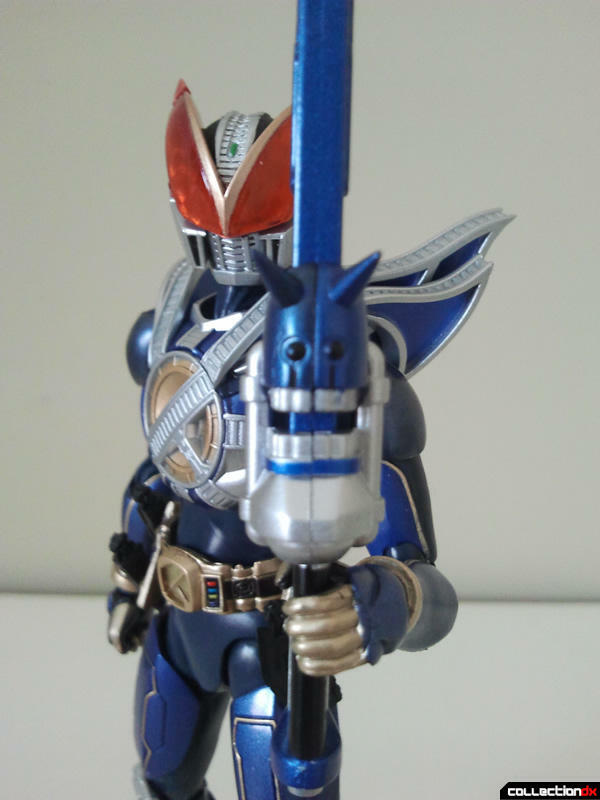 New Den-O also comes with a tiny Rider Pass. He can not hold it however, so it's kind of useless. 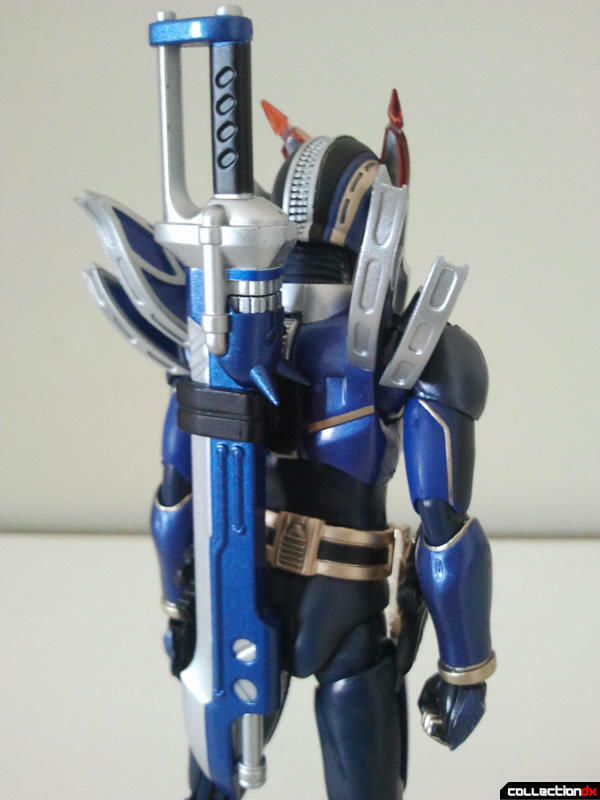 There is also an alternate back piece to allow New Den-O to hold Teddy on his back. 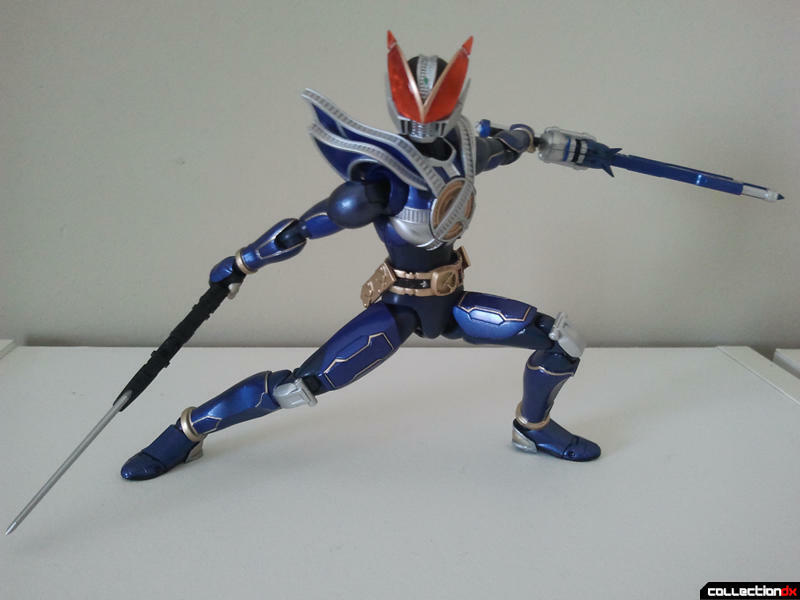 Thanks to the double jointed arms, New Den-O has no trouble at all holding his sword with two hands in a wide range of poses, and also looks just as good dual-wielding weapons. 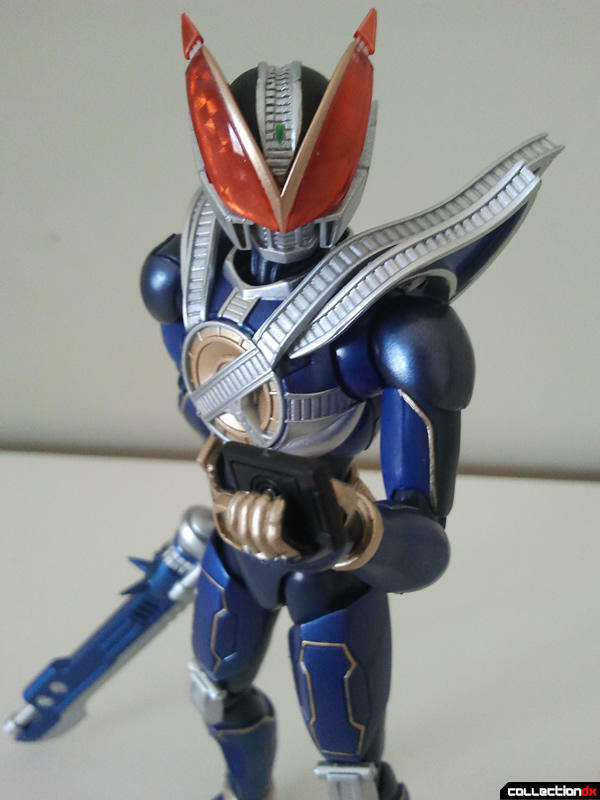 New Den-O is one of the best Figuarts to have come out in recent memory. 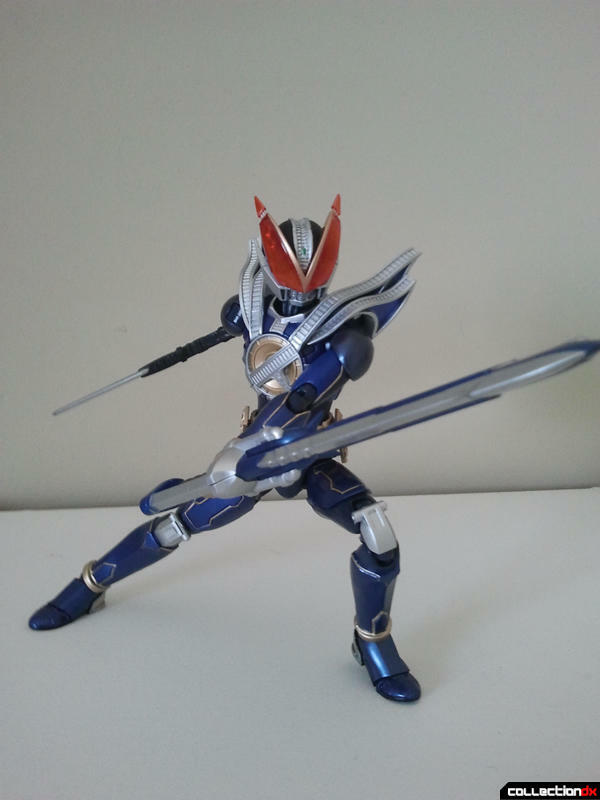 With so many weapons and accessories, it's a great value for a Figuarts. 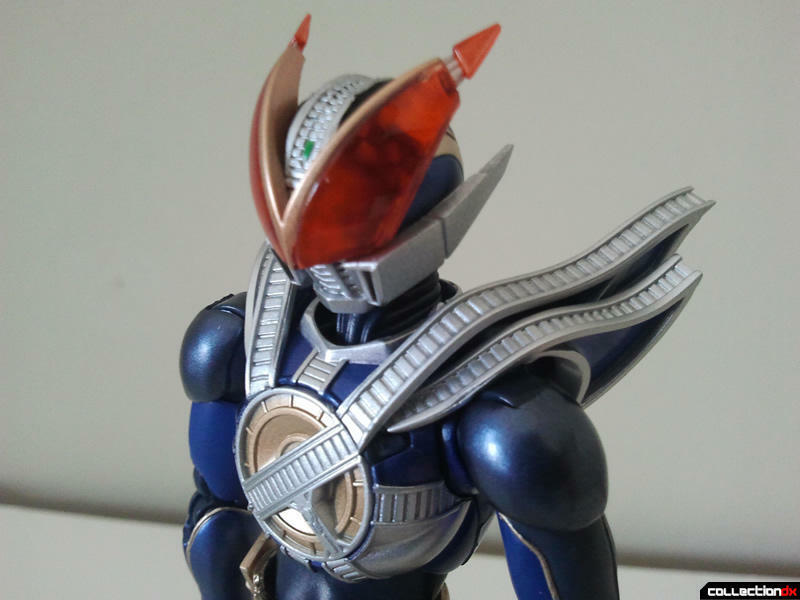 Many other Figuarts releases can seem a bit bare-bone when it comes to accessories, but New Den-O does not have this problem. 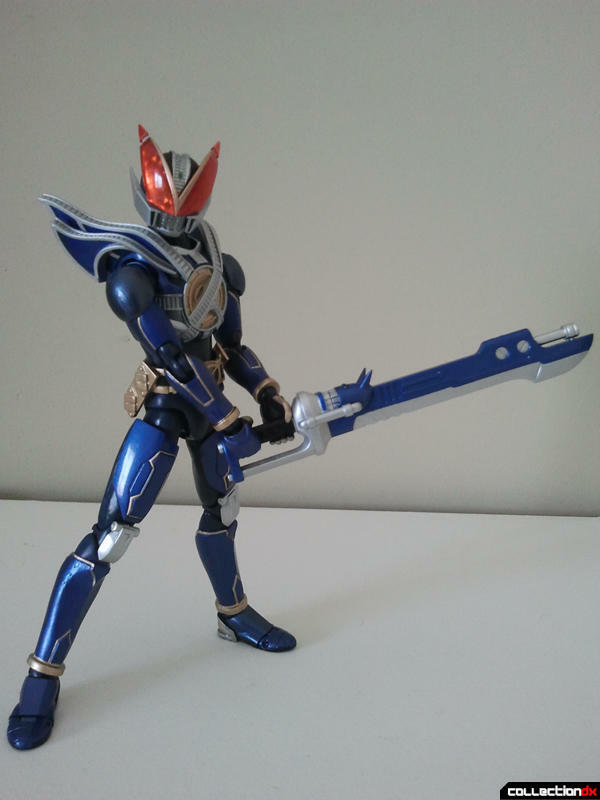 Get this figure if you think he looks cool, he is definitely worth it.